The Mission of the Division of Pediatric Neurosurgery at The University of Texas Medical School at Houston is to improve the health and welfare of children requiring neurosurgical care. We strive to do this by promoting a close cooperation between our pediatric neurologists, referring physicians, and hospital personnel. In conjunction with the Texas Comprehensive Epilepsy Program, our epilepsy program is one of the largest in the country. Craniofacial abnormalities in children have been an interest at this center for twenty years. The non-surgical management of these problems has created a flow of patients to Houston from around the country and various parts of the world. Our ability to transport extremely critical patients over long distance with one of the first air ambulance programs developed in the United States has resulted in salvaging many patients that previously would have died. 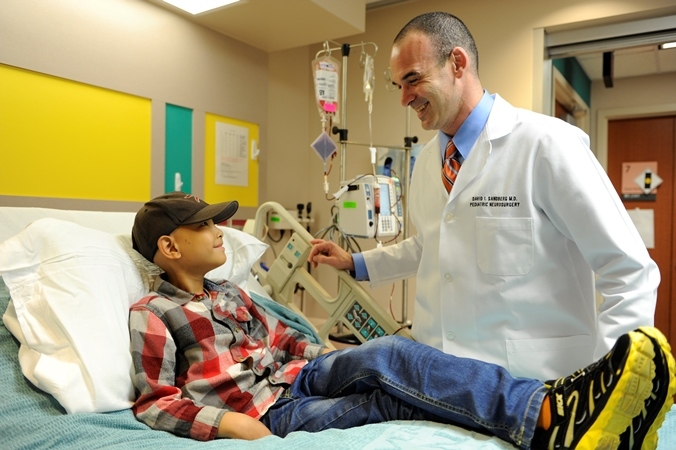 We have one of the largest pediatric neurosurgical trauma services in the country. A consequence of having a large dedicated 24-hour critical neurosurgical service is the development of extensive experience not only in trauma, but other critical events such as pediatric vascular disease. Our long standing interest in the surgical management of brain tumors is accentuated by our Gamma Knife program. We work closely with our associates at the University of Texas M.D. Anderson Cancer Center to provide a comprehensive management scheme for nervous system cancer in children. Congenital anomalies are addressed on a daily basis. Complex spine disorders are handled at a variety of institutions including our long-standing relationship with the Shriner’s Hospital for Crippled Children in Houston. We look forward to addressing any needs for your child. We have taken the lead to help develop the Memorial Hermann Pediatric Neuroscience Center. In conjunction with a variety of specialists in the neurosciences, we look forward to helping children with nervous system disorders.